Are you interested in sharing and exchanging little-known facts? If so, then you’ll love tomorrow’s unofficial holiday, National Trivia Day. Although the exact origin of Trivia Day is unknown, many people credit the game, Trivial Pursuit as the start. The creators of the game, Chris Haney and Scott Abbott, wanted to play Scrabble but were disappointed to learn several of their board games’ pieces had gone missing. Rather than dwell on their misfortune, they decided to create their own game. The concept of Trivial Pursuit was conceived in a matter of hours. The Wisconsin Lions Camp was the dream of which well-known Lion? Ray Hempel. How large is the camp in acreage? 440. How tall is the famous Totem Pole Na-Wak-Wa? 38 feet. Louie the Lion, the guardian of the Wisconsin Lions Camp, is made out of what materials? Concrete and old gun barrels. The Eyeglass Recycling Center in Rosholt is one of how many worldwide facilities? 18. At any given point, how many pairs of eyeglasses are available at the ERC? 125,000. How many Americans are affected by hearing loss? An estimated 48 million. What percentage of a child’s learning is related to sight? 80%. Vision problems affect one ins how many school-aged children? 4. How many children are adequately screened for vision problems in the US? Less than 20%. Finally, did you know that your donation to Lions Pride helps us to preserve, protect and provide for all of these projects and more? What’s more, you have the ability to designate your gift to the project of your choice. Together, we have the opportunity to reach, touch and improve lives all over the state; and we are so appreciative of your continued support. While we may not have any white, fluffy snow on the ground (as of writing), there is no question that the holiday season has arrived. Yesterday was the celebration of St. Nicholas. Although the holiday is a popular one in Europe, the day isn’t widely celebrated here in the United States, and we think it’s time to change that! The story of St. Nick goes back to 4th century Greece. Nicholas of Myra officiated as a bishop after dedicating his life to giving to others. Sadly, his parents died in an epidemic when he was young. With his extensive inheritance, Nicholas decided to use his wealth to help the less fortunate. His signature act was leaving gold coins in people’s shoes around the city. Today, children leave out stockings or shoes on the eve of St. Nicholas and awake to find them filled with small gifts and trinkets. Of course, there is always the possibility that those who have been naughty will find nothing more than a lump of coal. We may have missed the official holiday, but that doesn’t mean we can’t still celebrate the true meaning behind the season – focusing on giving more than receiving. Sometime in December, consider surprising your loved one by filling his or her stocking with fun, little gifts. There are endless possibilities for stocking stuffers – candy, jewelry, small toys, soap, notebooks, key chains and more. You can also include other intangible gifts such as a donation to their favorite charity in their honor. By choosing to make a gift to Lions Pride, you can help us work to continue improving the lives of people all around Wisconsin. Your donation can help preserve, protect and provide for Lions Camp and all other WLF statewide projects – including eyeglass recycling, adult and children’s vision screening, diabetes education and more. If there is a project that is especially important to you or your loved one, simply designate the gift, and you can rest assured knowing that you’re helping the cause. Print the certificate and add it a stocking for a powerful gift that also gives back. Together, we can all embody the spirit of St. Nicholas by remembering to include compassion and charity in our daily lives. After all, isn’t that the reason behind the season? It’s time to open our eyes and really focus on the world around us. Help us celebrate World Sight Day on October 13, 2016. World Sight Day is a day for organizations all over the globe to shine light on preventable blindness. 2016 is the fourth year of the World Health Organization Action Plan; this year’s Call to Action is “Stronger Together.” This year, IAPB is encouraging all participants to focus on all the stakeholders who are essential to successful eye care delivery such as doctors, schools, donors and more. After all, we are stronger when we work together. You may have already noticed that World Sight Day falls right in the middle of Lions Worldwide Week of Service – this is no coincidence! You and your club have an excellent opportunity to save sight in your community while also participating in the Centennial Service Challenge. Work with local eye care professionals to organize an eye health and safety presentation. Sponsor a Braille exhibit at your local library. Conduct vision and diabetes screenings for elderly persons at local residential living facilities. Provide local schools with assistive technology to help meet the needs of students who are blind or visually impaired. Organize a community “sight walk” to raise funds in support of Lions Pride or other organization. Arrange for a person with a guide dog to be a guest presenter at your club’s community event. Hold an educational event to promote diabetes awareness and related vision loss. Provide braille books to children and adults who are blind. Collect and send used eyeglasses to the Lions Eyeglass Recycling Center. Organize a community self-help group for persons who are blind/visually impaired. No matter how you choose to serve, know that you are making a huge difference to the sight of your community. Don’t forget to use the hashtag, #lions100, if posting your service projects to social media! On behalf of all of us at Lions Pride, we’d like to wish you a successful Worldwide Week of Service! We’re on the road again! This week, Lions Pride will be heading to Green Bay for the 2015 B2 Convention. While we look forward to all of our conventions, we’re especially excited for this one. Our excitement is due to the all-star line-up of convention presenters. This weekend’s topics will include blindness myths and realities, annual vision screening results and club management tips. We will also hear from a special guest, PDG Len Quinn, field representative for Leader Dogs for the Blind. Len will be discussing the “Leader Dog in Prison” program. Before Leader Dogs become, well, Leader Dogs, they start out as puppies in need of socialization. To accomplish this important job, Leader Dogs for the Blind have found success by working with prisons. For approximately one year, inmates work to raise Future Leader Dogs by naming the puppy, housebreaking and basic obedience training. The program has been going on for nearly nine years and has seen outstanding results. We don’t want to spoil any more of the details so you’ll just need to hear it from Len this weekend. On Saturday, get ready to get energized! The Luncheon Speaker is Carl “Energizer” Olson. 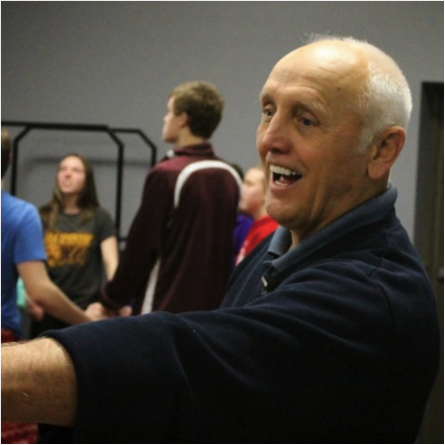 Carl founded “Energizer Olson” in 1993 after a successful career in education and coaching. He is on a mission to empower his clients for success with motivation, attitude and current theory as well as humor. Energizing is his forte, so we are all in for a real treat. We’ve got another weekend of fun ahead of us. Who else is excited for the B2 Convention? Lions Pride is looking forward to seeing you there! June is finally here which most that most likely school is the furthest thought from your child or grandchild’s mind. They may not be sitting in front of a whiteboard in a classroom every day, but that doesn’t mean you should forget about the importance of your child’s vision. After all summertime is full of fun visual activities that no one will want to miss like Camp! June is Child Vision Awareness Month. Since 1998, the WLF has partnered with Prevent Blindness Wisconsin to fight blindness across the state. The goal of the children’s vision screen project is to ensure that all children in the state of Wisconsin, from ages 6 months to 18 years old, have a proper vision screening, and are referred to an optical professional, if necessary. The importance of vision screening is crystal clear. In the past year, 51 Wisconsin Lions Clubs screened 15,601 children; of those children, 1047 were referred to an eye care professional. Vision problems affect one in five school-aged children and one in twenty preschool-aged children. When vision problems begin in early childhood, a child may not know that he or she has a problem because the brain compensates for the poor vision, so the child will not complain about the symptoms. The parents may also not witness any symptoms. Without early detection and treatment, a small problem could lead to complications down the road such as permanent vision loss, learning difficulties and delayed development. By carrying out vision screenings in your community, you can help parents and their children identify common vision problems including Amblyopia, Stigmatism, Hyperopia, Refractive Errors and more. If you are interested in bringing child vision screening to your area Lions Club, follow these steps to get started. Together, we can all continue to protect and preserve the gift of sight for a lifetime. Happy Child Vision Awareness Month from all of us here at Lions Pride! Before the hustle and bustle of the holidays begins to consume us, now is the time to consider our year-end giving plans. I am asking you to consider making your personal donation to the Lions Pride Endowment Fund to help us continue our quest to be ‘today’s help, tomorrow’s hope’ for children and adults with special needs, served by Lions Camp and the other WLF projects. At this time of year, reflect on the impact you have to improve their lives. We’ve helped some 100,000 campers since Lions Camp began in 1956. But Lion & Lioness Club donations alone no longer support the real cost of our mutual effort; private donations are required to preserve, protect and provide for the legacy that began with Lion Ray Hempel’s dream 58 years ago. There’s no better place to direct your donation than to the Lions Pride Endowment Fund. You will be giving a gift that keeps on giving for years to come. Your donation to the Lions Pride Endowment Fund means you’ll be serving people in your local communities who benefit from the services provided through Lions Camp, Children & Adult Vision Screening, Diabetes Awareness and Education and for people across the globe given the gift of improved sight with glasses from the Eyeglass Recycling Center. Your year-end gift will allow us to continue to reaching, touching and improving lives as we strive to be “today’s help, tomorrow’s hope”. PS: For more about year-end (and year-round) giving, visit our website at www.lionspride.org. Last week, we mentioned that we attended the District 27-B2 Convention in Green Bay. During the convention, members gave an exciting announcement. District 27-B2 will be receiving a $37,474 grant from the Lions Club International Foundation (LCIF) to purchase Spot vision screening cameras. It is estimated that approximately 15,000 children will benefit from this service. 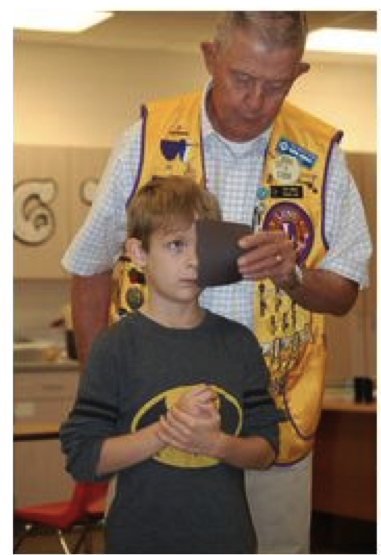 Children’s vision screening is a program close to the hearts of many at Lions Pride and the Wisconsin Lions Foundation. Throughout the years, we have learned that nearly 80 percent of a child’s learning is related to sight. That’s why the Wisconsin Lions Foundation has teamed up with Prevent Blindness Wisconsin to certify lions and lionesses all across the state for vision screening. Once certified, many clubs sponsor and conduct vision screenings locally. The goal of the WLF Children’s Screening project is to ensure that children anywhere from six months to teens have had a vision screening. This is a great reminder to all Lions Pride donors that your support helps Lions provide services to many children and adults in the state of Wisconsin. Lions Pride Endowment Fund is helping preserve, protect and provide for all Wisconsin Lions Foundation projects today and for generations to come. We thank you for your continued support.